I am a caffeine addict!! I drink a lot of tea at home, and when I am in the car its coffee, coffee, coffee!!! With two kids, and a very busy career, I need to be awake and alert. Especially this past week when I was driving 400+ miles a day!! Luckily for me, I was sent a 6 pack of 5 Hour Energy to try, and it came in handy!!! By the end of each day, I was falling asleep. I needed a boost, and coffee just wasn't cutting it. Each afternoon, I would take a 5 Hour Energy and would make it home safely!!! I was sent Berry flavored (original.) It is a little sweet tasting, but it did the trick. With in two minutes, I was not yawning anymore and I actually felt much more alert. These little bottles pack a punch!! 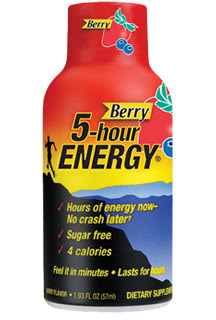 If you lead a busy life like I do, and need a boost here and there, 5 Hour Energy will help!! How would you like to try some?? My good friends at Smiley360 and 5 Hour Energy would like to send one lucky reader a 6 pack to try like I got!! I could use this at work about 3:00. I could have used a 5 hour energy last week on my 12 hour drive home! I could use this the most around 3 oclock at work!!! I have a 7 month old who still doesn't sleep through the night. I always need energy!